The success and proliferation of integrated circuits (IC) has largely hinged on the ability of IC manufacturers to continue offering more performance and functionality for the money. 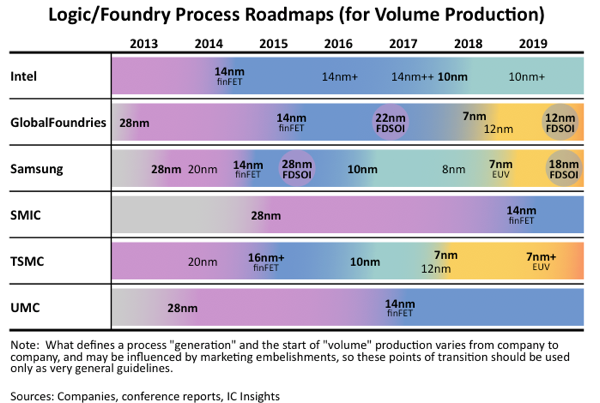 Driving down the cost of ICs (on a per-function or per-performance basis) is inescapably tied to a growing arsenal of technologies and wafer-fab manufacturing disciplines as mainstream CMOS processes reach their theoretical, practical, and economic limits. Among the many levers being pulled by IC designers and manufacturers are: feature-size reductions, introduction of new materials and transistor structures, migration to larger-diameter silicon wafers, higher throughput in fab equipment, increased factory automation, three-dimensional integration of circuitry and chips, and advanced IC packaging and holistic system-driven design approaches. For logic-oriented processes, companies are fabricating leading-edge devices such as high-performance microprocessors, low-power application processors, and other advanced logic devices using the 14nm and 10nm generations (Figure 1). There is more variety than ever among the processes companies offer, making it challenging to compare them in a fair and useful way. Moreover, “plus” or derivative versions of each process generation and half steps between major nodes have become regular occurrences. For five decades, the industry has enjoyed exponential improvements in the productivity and performance of integrated circuit technology. While the industry has continued to surmount obstacles put in front of it, the barriers are getting bigger. Feature size reduction, wafer diameter increases, and yield improvement all have physical or statistical limits, or more commonly…economic limits. Therefore, IC companies continue to wring every bit of productivity out of existing processes before looking to major technological advances to solve problems. The growing design and manufacturing challenges and costs have divided the integrated circuit world into the haves and have-nots. In the June 1999 Update to The McClean Report, IC Insights first described its “Inverted Pyramid” theory, where it was stated that the IC industry was in the early stages of a new era characterized by dramatic restructuring and change. It was stated that the marketshare makeup in various IC product segments was becoming “top heavy,” with the shares held by top producers leaving very little room for remaining competitors. Although the Update described the emerging inverted pyramid phenomenon from a marketshare perspective, an analogous trend can be seen regarding IC process development and fabrication capabilities. The industry has evolved to the point where only a very small group of companies can develop leading-edge process technologies and fabricate leading-edge ICs.